The Bent Sea Rod is easy to identify. They are usually large and either grow in a flat tree shape or sort of bushy. 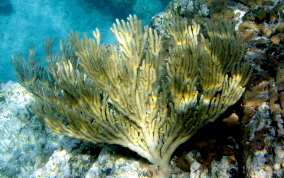 When polyps are extended they have a soft, furry look. Their color is usually a yellowish brown, golden yellow tan or sometimes a ting of purple. They survive best in very clear water on the patch reefs or rocky shorelines that extend out toward the sea. Sometimes they almost look like knobby sea rod, but I think that's when the polyps are starting to push out to feed. 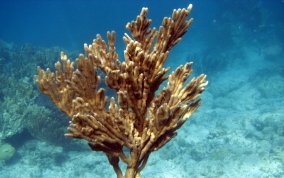 The Bent Sea Rods have nubby or little bends in their branches.